Do you need an all-in-one solution for your noise measurements? The Optimus Green gives you all the noise data you could possibly need for environmental, occupational and industrial noise. By measuring every parameter you need simultaneously, the Optimus Green records everything in one measurement. There's no risk of choosing the wrong function or missing any data. All you need to do to get going is switch on, calibrate and start. It's that simple. All of your measurement data displays on the large OLED screen. You'll be able to see straight away if there are any noise issues that need further investigation. You can easily navigate screens during measurements to see the data you need. Whether it's environmental noise monitoring, detailed noise analysis using audio recording or workplace noise measurements, the Optimus Green has you covered. See what the Optimus Green can do for you. Contact our Noise Experts today. 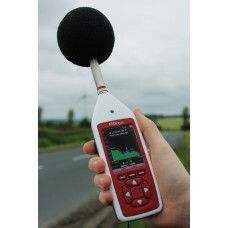 A Total Solution for Occupational and Environmental Noise MeasurementsOptimus Green Sound Level Mete..
A Total Solution for Occupational and Environmental Noise Measurements Optimus Green Sound Level ..